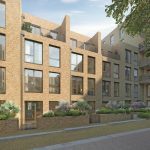 Brentford Lock West is launching a collection of six four-bedroom townhouses at Keelson Gardens, part of the waterside development. John Robinson, Development Director at Brentford Lock West, said: “The townhouses at Keelson Gardens provide buyers with a rare opportunity to secure themselves a stunning new family home in a tranquil waterside setting, while still benefitting from being within easy reach of the Capital. The wider development already enjoys a real sense of community, making it a genuinely vibrant, friendly and welcoming place to live. Set alongside the Grand Union Canal, Brentford Lock West forms part of a long-term regeneration project delivering in excess of 500 new homes.